In the 1800’s, before assigning names to roads was a common practice, intersections were often given names to identify communities and places of interest. 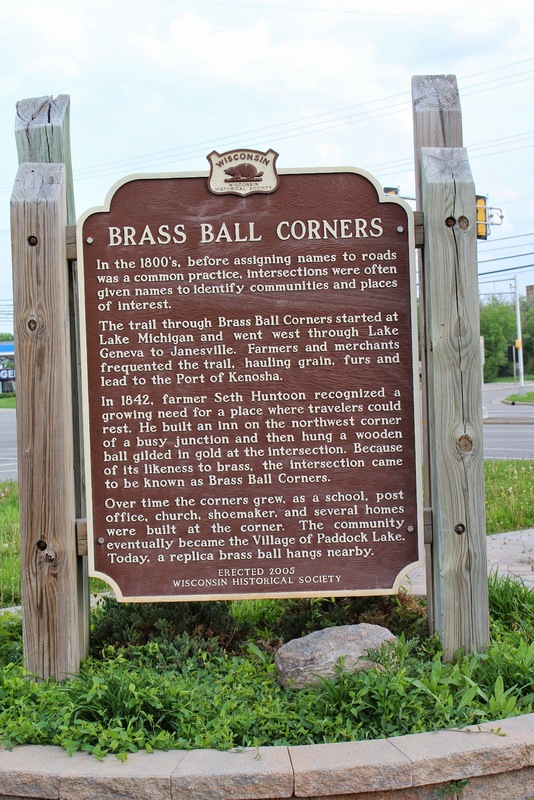 The trail through Brass Ball Corners started at Lake Michigan and went west through Lake Geneva to Janesville. Farmers and merchants frequented the trail, hauling grain, furs and lead to the Port of Kenosha. In 1842, farmer Seth Huntoon recognized a growing need for a place where travelers could rest. He built an inn on the northwest corner of a busy junction and then hung a wooden ball gilded in gold at the intersection. 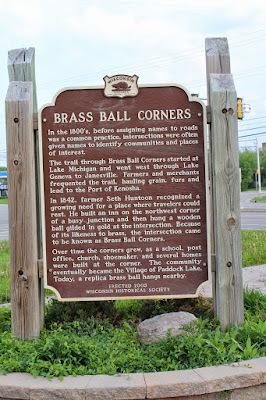 Because of its likeness to brass, the intersection came to be known as Brass Ball Corners. Over time the corners grew, as a school, post office, church, shoemaker, and several homes were built at the corner. The community eventually became the Village of Paddock Lake. Today, a replica brass ball hangs nearby. The marker is located in a grassy patch on the southeast corner of the intersection of 75th Street / State Highway 50 and Antioch Road / State Highway 83, across the street from a Walgreen's, Salem, Wisconsin 53168. NOTE: The placement of this marker makes absolutely no sense. The marker is turned away from the road (see photos below), so the only way the marker can be read -- nay, even seen -- is by parking one's car across the street and walking across a very busy intersection over to the marker -- which is what I had to do to photograph it. This goes under the category -- what WERE they thinking?? Photo taken from Walgreens parking lot, across the street. How much would another sign on the backside cost? I believe the markers are about $8,000 -- it would make more sense to just remount the marker. The markers weigh a couple of hundred pounds or so. How about this post actually have a picture with the "Brass Ball"? Who cares about the marker? This is not about the Brass Ball Corners Marker! WOW! What a jerk you are, daskemper!! I suggest you go out and create your own website, since you think you know so much. BTW, this website IS about the marker -- or are you unable to comprehend the English vocabulary significance of "Wisconsin Historical Markers". What a pathetic person you are -- the worst comment I've ever received on this website after being online for more than five years.